Australian property developer Golden Age Group embarked on one of its biggest years to date with the combined completion of three projects, announcing plans for its second Box Hill site, making its first foray into land and industrial development and launching Sky Garden, the first retail- anchored residential project of its scale in the country. Tenacious would be one word to describe Golden Age Group and its firm foothold in the Australian property landscape. With several projects on the go spanning Melbourne and Sydney, the developer has paused to reflect on the year that was. Forming a partnership with retail giant Vicinity Centres, Golden Age Group launched Sky Garden this year – its 555-apartment project set across three towers to be built atop The New Glen shopping centre that is currently undergoing $460 million in extensive redevelopment. Sky Garden is the first in the Australian market to offer a retail-anchored residential development of this scale. 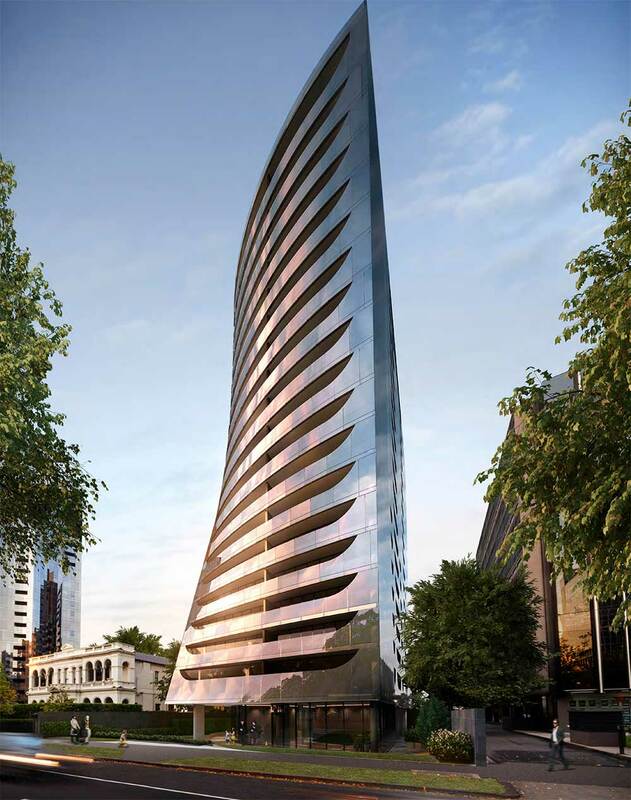 In July, Golden Age Group celebrated the completion of Opéra, its luxury project situated on Melbourne’s St Kilda Road. Designed by Golden Age Group ongoing collaborator and renowned architects Bates Smart, Opéra sought to celebrate Melbourne’s unique arts and cultural scene. Emulating the elegant form and movement of a ballerina, the building’s curved exterior form instils a touch of drama and decadence. Each panel of the cold-bent glass façade is entirely unique and strategically composed to create a sweeping curve. Circular motifs carry throughout the shared spaces in reference to the iconic glass façade; most prominent in the grand lobby that welcomes residents as they arrive. The architects sought to restore the grandeur St Kilda Road was once known for with a focus on fine materials and details. The private amenities are concentrated on the first two floors creating a hub of activity for residents to meet and mingle. 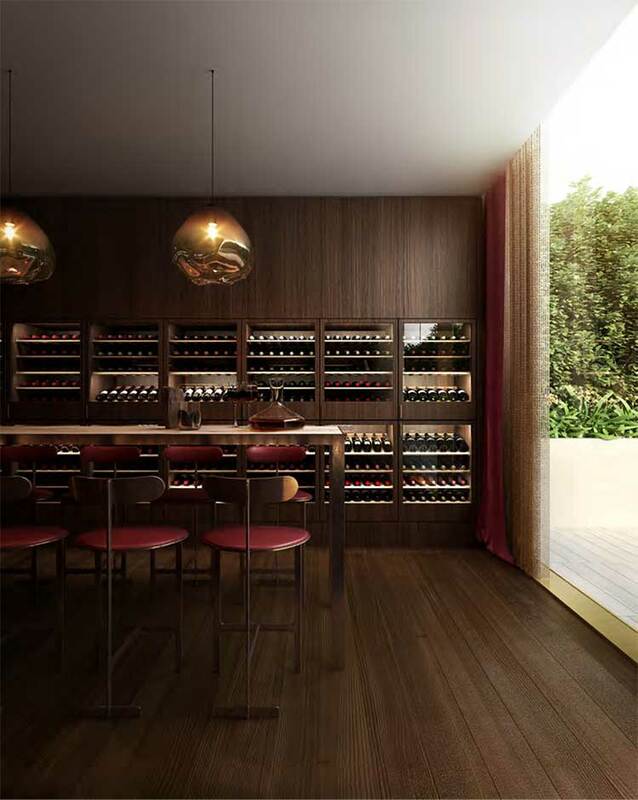 A library, parlour, dining room, kitchen and wine cellar are available for residents to use or book for private events, acting as an extension of each apartment. Alongside these offerings is a gymnasium and sauna - custom designed with timber undulating gracefully from the floor to ceiling to form bench seats. Another feat of architectural brilliance is the state-of-the-art pool whose dark beauty was specifically designed to emulate the feeling of being in a cave. Strategic use of concealed lighting and acoustics help to achieve this unique effect. Internally, residences are fitted with herringbone parquet flooring and veined marble benches, all designed for a community that resonates closely with art and culture. “Location, views and quality fittings shouldn’t be a property’s key selling points – for us, they are the basic standard. What follows – lifestyle, community, elegant design solutions – are what sets Opéra, and Golden Age Group, apart from the rest,” said Mr Xu. Elsewhere in Melbourne, Golden Age Group’s 75-storey tower Victoria One reached completion in June, achieving a 100 per cent settlement rate where residents promptly moved in to what is currently the tallest completed residential building in the CBD. Victoria One’s sparkling tea-green façade is an architectural expression of Victoria’s rugged landscape and marks a new icon for Melbourne’s skyline. Also set to reach completion this year is Essence Double Bay, Golden Age Group’s boutique Sydney development consisting of 38 residences. “Completing these large projects in the space of a year is a testament to our ambition. We pride ourselves on collaborating with the industry’s finest to deliver projects that push boundaries,” said Mr Xu. Construction is currently underway for Collins House in Melbourne’s CBD, Sky One in booming suburb Box Hill, and Park One and The Harrington Collection in Sydney. Earlier this year, Golden Age Group submitted grand plans for its second Box Hill site on Station Street, adjacent to Sky One. Located in Box Hill’s major development hub, the project will significantly contribute to the public realm, cementing the suburb’s status as a genuine alternative to the CBD for employment, investment and entertainment. “We have identified Box Hill as a major hotspot for activity and believe in its resounding investment stability,” said Mr Xu. “We also strongly believe in the resilience of the luxury market - we have seen ongoing demand for high-end product at our projects 85 Spring Street in Melbourne and The Harrington Collection in Sydney. The desire for prestige property in blue-chip locations will always prevail,” said Mr Xu. In a move to further diversify its robust portfolio of residential, commercial, hotel and hospitality venues, Golden Age Group also announced the acquisition and plans for it first land development, Willow Springs in Victoria’s Rockbank, alongside a move into industrial development. "Rockbank is the perfect opportunity to bring our reputation and expertise to the land development sector. A significant proportion of Victoria's expected population growth is predicted to be absorbed by the western fringe. As a developer, it is our responsibility to outpace that growth and facilitate the expansion of Melbourne,” said Mr Xu. It seems that Golden Age Group has mastered the art of multitasking, as they also plan for what the new year will bring. “Following our impressive 2018, we are looking forward to some equally exciting partnerships and Australian firsts for the new year which we will share very soon,” hinted Mr Xu.